1. Enter the URL of the App Volumes server in the "App Volumes Manager" text box (https://avmanager.company.com). Click "Connect to App Volumes API". 2. Enter Username, Password and Domain of an account that is in the App Volumes Admin group. 3. If the certificate on the App Volumes manager is not a trusted certificate (self-signed, CA generated) you will receive a warning that the certificate is not trusted. Review the details of the certificate provided and if everything looks good, click "Accept" to accept the certificate and add an exception (you won't be prompted again for this certificate). Click "Cancel" if you don't trust the certificate - in this case you will be unable to connect to the App Volumes manager until the certificate installed is trusted. Certificate trust exceptions are stored on a per user basis in HKCU\Software\VMware Flings\App Volumes Toolbox\Trusted Certs. This value can be cleared or deleted to remove any trusted exceptions. This shows any users and computers which are currently connected to the App Volumes Manager. This is helpful for determining if an App Volumes agent is properly connecting to the AV Manager. This tab allows one to view the App Volumes logs, which are great for troubleshooting and watching the status of events such as AppStacks importing. You are able to show the entire log file, a tail of the log file, and have the page auto-refresh on a specified interval. You can also download the entire file by clicking "Download App Volumes Server Log". This tab allows one to view the available AppStacks inventory, and details on those AppStacks. 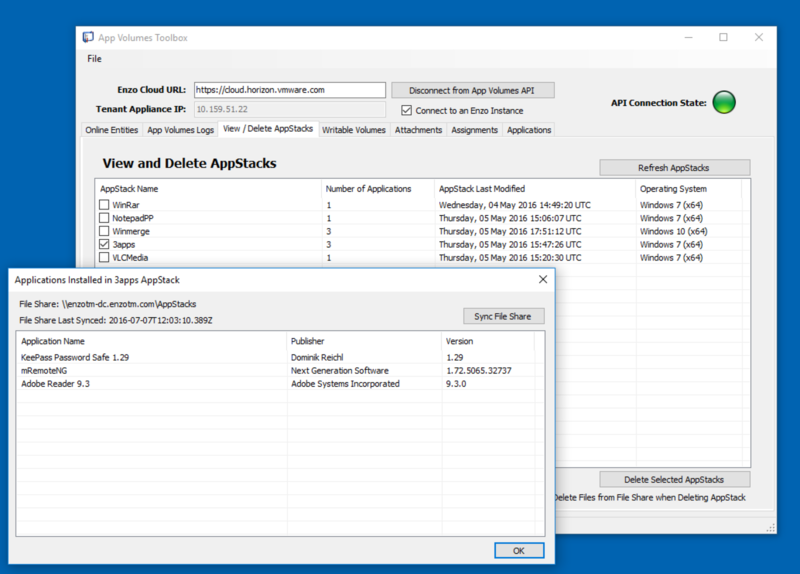 At a quick glance you can see how many applications each AppStack contains, when it was last updated and the Operating System it is targeting. If you select and right-click on an AppStack you will see a menu item called "Show Installed Applications". By clicking this menu item you will able to see details on each application installed within the AppStack. This tab allows management of user Writable Volumes. You can view utilization, if a Writable Volume is currently attached, check if enabled or disabled and see the last time it was mounted. You can also enable or disable, expand and delete Writable Volumes. This tab shows any currently attached AppStacks or Writable Volumes, as well as the endpoint they are connected to, when they were attached and the duration.